I've never ordered before. I don't know which size vinyl labels pack would be best. Can you help? not suitable for use on clothing although they can be used on wetsuits! Can I split a pack into two names? Unfortunately not, for most of our labels our production process only allows one name per pack. The exception to this is our classroom vinyls which allow you to order up to 26 names (min. 2 labels per name). 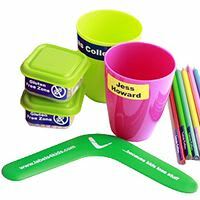 Please note that classroom vinyls are only available in small vinyl size (50mm x 20mm). I want labels for my child’s pencils. Which will fit? Mini vinyl labels are ideal for pens and pencils. 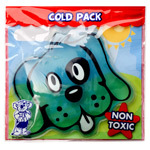 For older children why not consider transparent labels with black text. 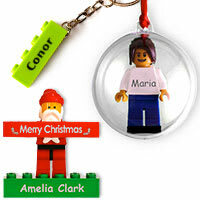 Can I order a personalised bag tag with only a picture and no wording? 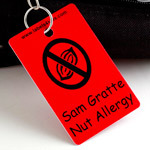 Yes, our bag tags are made to your design. 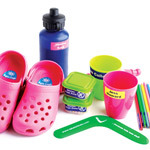 Colours, text styles and image choices are all shown on the product page. The school wants to order a pack of labels for drinks bottles for every class. 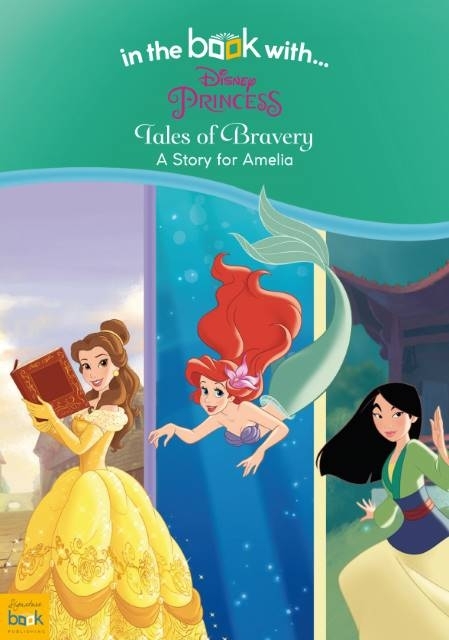 Can we supply class lists for this and have some labels for each child? 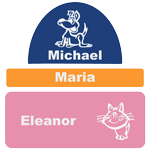 Yes our classroom vinyls allow you to order up to a maximum of 26 names per pack (min. 2 labels per name) . 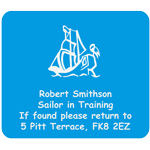 Please note that classroom vinyls are only available in small vinyl size (50mm x 20mm). Can I order by telephone instead? by telephone, however there is a higher risk with phone ordering that we may make errors in the spelling of your name. I want to order id bands for a trip but I don’t know what to choose. If you have any questions regarding your order please don’t hesitate to contact us. How do I apply my name labels? All orders are supplied with a full set of instructions. Application instructions can also be found at the bottom of the relevant product page - click on the blue "Instructions" tab for an application tutorial. 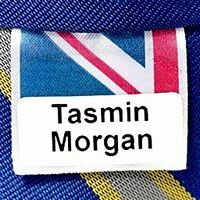 Which labels are the best for school sports (drawstring) bags? 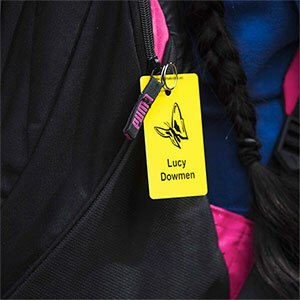 Jacket name tags are ideal for drawstring bags – especially swimming bags. 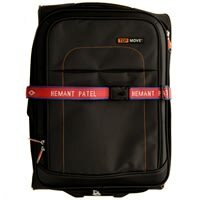 We do also supply personalised gym bags which do not need additional labelling. 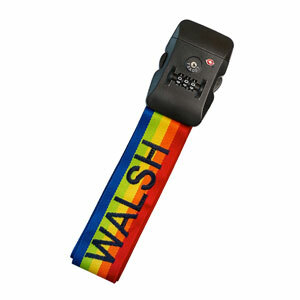 Will your labels stay on beach equipment, inflatables and armbands? Vinyl labels will stay on all of these items as long as they are applied, in the first instance, to a clean, dry, smooth surface. 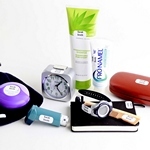 The longevity of the label may be reduced on items which undergo a lot of handling eg. beach balls and surf boards, particularly if they have a curved or textured surface. Try our transparent Covers for Vinyl Labels to give your vinyl labels extra protection. 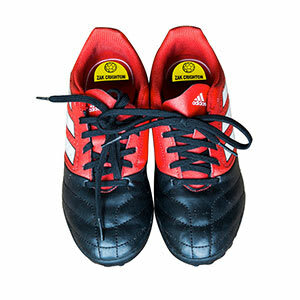 Can shoe labels be used on other things? Yes, vinyl shoe labels can be used in the same way as the other vinyls in our range – however they are unsuitable for use on clothing. 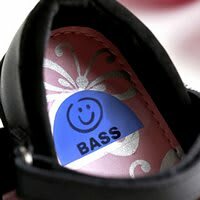 When you use the vinyl shoe labels inside shoes don’t forget to apply the transparent protective cover over the top of the label, this will prevent perspiration from the foot reacting with the ink and lifting the colour from the label. 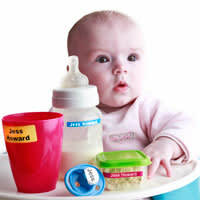 Will your labels go through a baby steriliser on a baby bottle or comforter? Yes. Vinyl labels are microwave and dishwasher/steriliser proof up to 90 degrees and the hotter the better. The only time your label may lift is if it has been applied to damp or oily surface, or if it has been applied with a bubble in the label allowing some steam/water in the dishwaher/sterliser to get under the label itself. Try another label and make sure it is applied with no bubbles or creases. How long will it take to get my labels? Our personalised products are made to order and average production times are published at the bottom of each product page under the blue tab "Delivery & Production". Please note that orders are not despatched until all items on the order are available. Following production of your labels we deliver using first class Royal Mail as standard (or Airmail for overseas). UK orders - Royal Mail advise that 90% of first class mail is delivered the following day, the remainder can take up to 3 days to be delivered. We are unable track and trace first class post. If you require a tracking service please select Special Delivery as your preferred shipping method. Airmail - Airmail items cannot be tracked or traced. If you select International Signed/International Tracked & Signed as your preferred shipping method your order is tracked until it leaves the UK - it is then handed over to the destination country's postal service as a priority item and requires a signature at the destination address. Please note that priority services cannot be delivered to post office box numbers. Does express delivery mean you will produce my labels quicker? 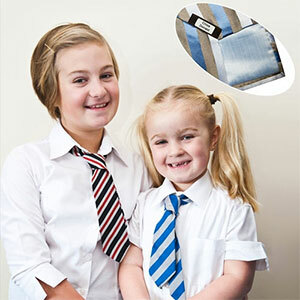 Express delivery options (Special Delivery or International Signed/International Tracked & Signed) do not affect production times but they do offer a guaranteed delivery service once your items have been despatched from Labels4Kids. Please note that these services require a signature at the destination address. Special Delivery orders are guaranteed for delivery before 1pm the next working day following dispatch of your order from Labels4Kids Ltd (except weekends). International Signed/International Tracked & Signed allows your order to be tracked until it leaves the UK - it it then handed over to the destination country's postal service as a priority item and requires a signature at the destination address. Target delivery time is three working days to Western Europe, five working days to Eastern Europe and seven working days for the rest of the world. I am moving abroad so will you deliver abroad if I order online? Yes. We deliver to all countries which the UK banks trade with. 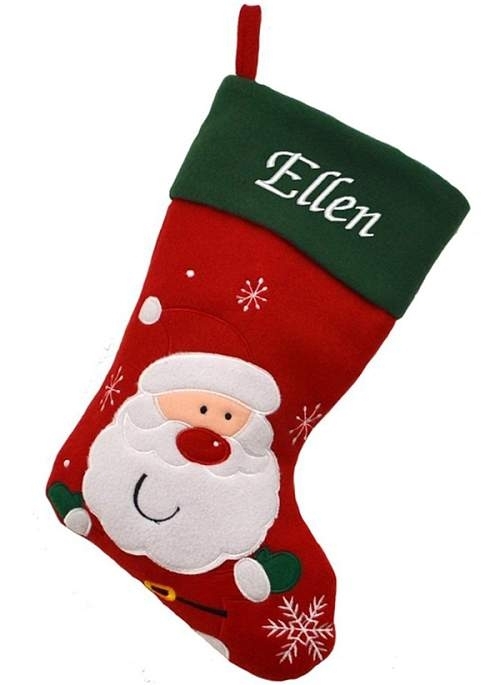 Will you deliver to a different delivery address as a gift? The billing address must be the registered address for your credit or debit card but you can specify a different delivery address at the time of ordering. If you have a special request please do not hesiate to contact us to discuss your requirements. Please note we do not offer a gift wrapping service. 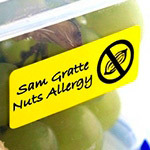 Can I order a standard allergy-free message on my labels without the standard allergy picture eg. Gluten Free with a rocket? Yes you can. First select the size of vinyl label you would like, click on the green button "Design Now", get creative, click on the grey button "Preview" then "Add to Cart". I want to register for fundraising (affiliate scheme). How do I do this? You no longer need to register for fundraising online. Just email us to receive a bulk fundraising pack and promotional posters/flyers for 20% commission. For full information regarding fundraising visit our "School Fundraising" section. I want to order more posters/flyers to promote our fundraising scheme. How can I do this? Tell us - contact name, delivery address and how many you flyers/posters you need. If you are requesting posters please specify small or large. 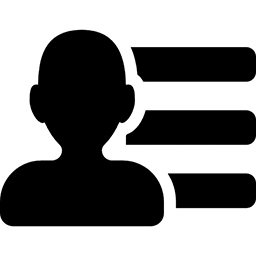 Email [email protected], contact us with the live chat on the bottom right of your screen, or phone Labels4Kids on 01786 473508 or 0333 1234559. 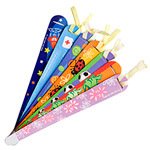 We will send out a sample pack of the items you require. 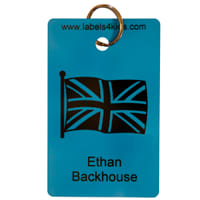 Why should I order from Labels4Kids? As a fast growing, award winning, family business we offer friendly, efficient and helpful service. For us the customer always comes first. Our goods are British made, produced and designed and we offer a massive choice of images, colours and sizes. We pride ourself on only offering the highest quality to our customers.